It’s all here … an 18-hole par 72 regulation course …a 9-hole Par 3 course… an executive style 9-hole course… a practice range …and a clubhouse with banquet facility capable of seating 180+ guests. The Championship course is tucked between Highway 57 and West 12th Street and west of Hudson Road. Well maintained and irrigated since 2005, you will find 159 acres of beautiful undulating terrain that measures 6,805 yards from the championship blue tees, 6,565 yards from the regular yellow tees, 5604 from the red tees and 5,413 yards from the white front tees. Water, sand and large greens are the main features of this course. Pheasant Ridge has a teaching center that includes practice range, putting green, and sand trap. The full line pro shop offers a complete line of golf merchandise, food and beverage, golf carts, pull carts and lessons. 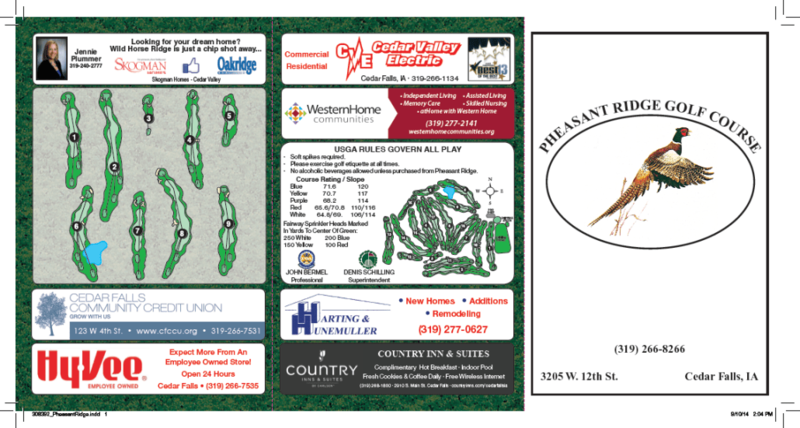 For more information on special rates and accommodations contact the Pheasant Ridge Pro Shop by calling (319) 266-8266. Golf lessons are offered at the Pheasant Ridge Golf Course. 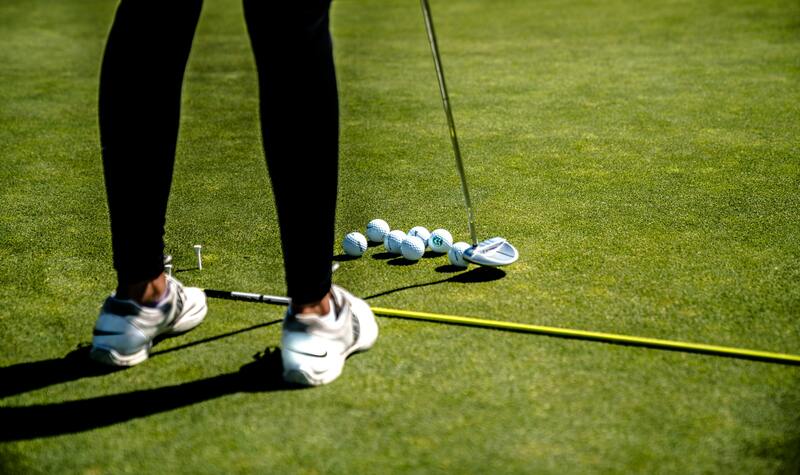 Whether it is a clinic run through the Cedar Falls Recreation Center or a one-on-one lesson with a trained golf professional, you can get the proper instruction. John Bermel, our head golf professional, has been teaching golf for more than 25 years. He has taught at many different golf schools, such as the John Jacobs Golf Schools, Executive Golf Limited Golf Schools and the JD Turner Golf Schools. Bermel was awarded the teacher of the year in the Iowa PGA Section in 2000 and was the Iowa PGA Junior Golf Leader in 1999, 2000 and 2007. He was also voted the Best Teacher in Iowa by Golf Digest in 2009-2010. There are Assistant Professionals that have taught under John for a number of years that are available to provide lessons as well. Our staff can help every player improve their game any way that they would like. Pheasant Ridge Golf Course is set up with a full Driving Range. There are 30 stalls across the spacious tee box. 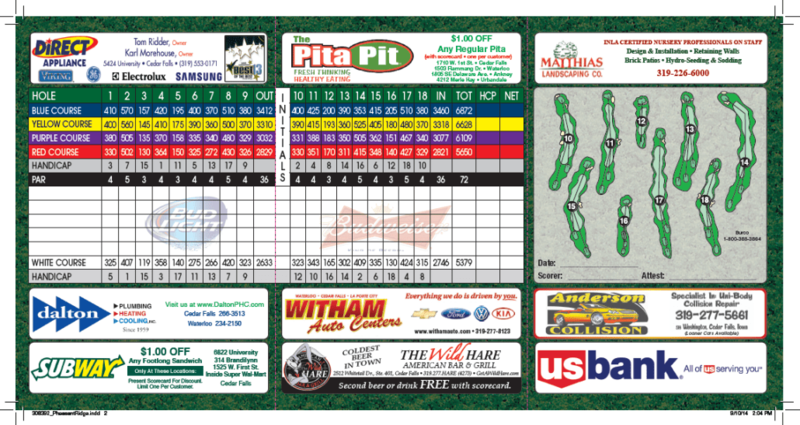 Our target flags start at 50 yards and increase in 50 yard increments all the way to 250 yards. There are metal bull’s eyes throughout the range at different yardage lengths. The loudest one (known as the doink) is located at 50 yards. The slanted metal targets are moveable and are usually located at distances of approximately 120, 140 and 160 yards. On the far left side of the driving range is a wedge range which consists of 4X4 pieces of concrete markers located 30 yards from the front hitting area in 10 yard increments all the way to 100 yards. There are two more teeing spots on the wedge range, one starting at 40 yards to the first target thru 110 yards the third area runs from 60-120 yards. There is also a chipping green off to the side of the tee box. This is a great place to work on your short game, chipping, pitching, sand and more. The sand trap is located so that you can hit to the adjacent green or you can hit fairway shots onto the range. We have a very expansive practice putting green with at least 7 holes cut into the green. Our concession stand offers a great menu with plenty of options. We are most well-known for our hamburgers, french fries, chicken strips and our famous beastie bites. In addition to the aforementioned food items, we serve Ice Cream, Slushies (Strawberry and Raspberry), Thelma’s lemonade, candy bars, chips, peanuts, cheese balls, fresh popcorn and much more. We offer fountain or bottled Pepsi products to drink and also serve beer on tap and in the can. Plenty of seating is available throughout the club house. Eight bar stools are at the front counter along with four tables for your group to relax. Bigger tables are also available to accommodate larger groups. There is seating on the covered patio that includes 6 regular picnic tables, 2 high top picnic tables and a concrete wall that can also be used for seating. The Pheasant Ridge Club House is a great place for golf and non-golf outings. We have one of the most popular facilities for graduation receptions in the area. The charge is based by the total rooms being rented. Please contact us at (319) 266-8266 for a customized quote to fit your needs. We have 13 round tables that seat 8 comfortably, along with 13 rectangle tables that seat 8. Our banquet facility menu will take care of any appetite that you may have after your golf or during your non-golf event. The Pheasant Ridge Golf Course is a Taylor Made, Adams, Adidas and Ashworth-exclusive club house. We handle all clubs that Taylor Made has to offer, along with Adams clubs, including the latest drivers, irons, wedges and putters. Golf gloves and balls are available to fit the wide range of patrons using the facility. Adidas clothing is one of the hottest brands available in the market. From shirts, shorts, slacks, pullovers, rain suits, ladies shorts, ladies shirts, ladies pullovers and both Men’s and Women’s shoes. Ashworth was once known as the top-of-the-line golf clothing that could be offered has been bought by Adidas. With their classic look and the new branding, the Ashworth/Adidas line is one of the best yet least expensive lines in the golf business. Any golfer can be outfitted into the best looking golf apparel in the business at the Pro Shop! The Pro Shop also offers items with the Pheasant Ridge logo and University of Northern Iowa logo on select items.